The history of the rotary dates back to the year 1902 in Germany. Mr Felix Wankel a German engineer was born in August 13th 1902 who invented the dorito engine that would make history for years to come. Mr Wankel came up with the idea of an internal combustion engine while he was only 17. He began the development and research of his dream engine which will go by the engineering of attaining intake compression and exhaust while in circular motion. His work and knowledge of the engine was brought to the German Aeronautical Research during world war II and that which later led to the German motorcycle company NSU Motorenwerk AG in the year 1951. Mr Wankel completed the first design in the year 1954 and it was first tested in 1957. The rotary engine did not have much moving parts and the basics were simple. The oribiting main rotor the shape of a triangle took intake.compressed the air and fuel mixture and pushed out the exhaust.After the success and invention of this rotating fascniation Mazda signed a formal contract in the year 1961. After signing the partnership Mazda took the rotary development to a new advanced level. They formed the (RE) research department in 1963. Mazda introduced the Cosmo Sport in 1977 and it was the first production car in the world to have the dual rotor engined sports car. The cosmo was an instant hit and it was way ahead of its time with its rotary technology. Mazda then began installing their rotary engine sedans and coupes. However during the global oil crisis of 1973 Mazda improved its rotary engine to improve fuel efficiency and by the end the sports car made by Mazda became popular in Europe and the US. Besides Mazda a number of companies licensed the Wankel engine but Mazda would be the pioneer to use it in production. Fast forward to the 1990s the legendary FD RX7 was born. However due to an economic recession in the JDM market, the market for sports car went down. Mazda was thoroughly working on improving fuel efficiency and have developed a side exhaust port system in the rotary block that will help provide better acceleration and linear power delivery. However it all went well till 2002 and due to an economic turn down, the FD Rx7s rotary production was shut down. Not for long however the team still worked on the engine and have developed the RENESIS. The Renesis was a new generation of rotary engine with a high power, smaller weight and increased performance. This engine eventually led to the development of the RX8. The Mazda rx8 was a totally futuristic concept. With its suicide rear doors and perfect 50:50 weight distribution and stiffened chassis and superb handling, it was the ultimate sports car of the new times. 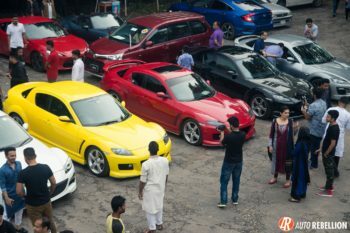 In Bangladesh , reconditioned JDM cars are imported and that is how many RX8s made their way into the country. 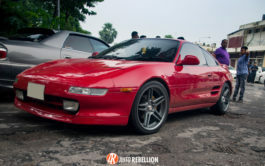 The top of the line with the 6 Speed Manual was called the Type S and the Automatic was the Type E. In our country only a handful of car enthusiasts are able to tame these cars and they are in very high demand. Most rx8s later throughout the years have gone with other engine swaps but the true enthusiasts stayed faithful to the RENESIS engine. 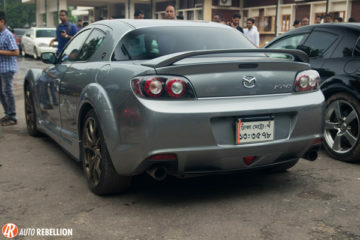 The last generation of Rx8s to be in the country would be the Spirit R based on the series 3 of the Rx8s. However there is only one FD Spirit R rx7 and one FD series Rx7 in the country. There’s also a handful of FC and the lovely Savanahs. 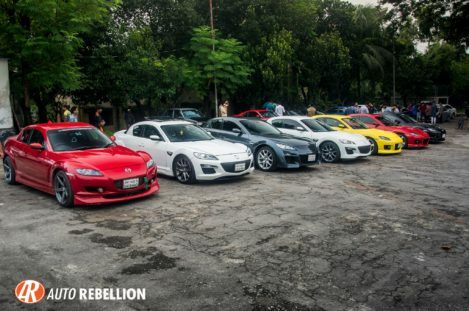 On August 11th 2017, to honor the invention of 50 years of rotary engine, a small meet was organized were all car enthusiasts of the country were invited. 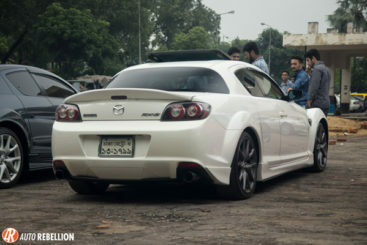 THe main attraction of the meet would be the RX8s of the country. The last generation of Mazdas to have the rotary engine. 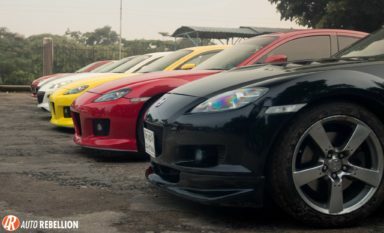 Besides the Rx8s a lot of other coolest tuner cars of the country dropped by to mark this event a success. 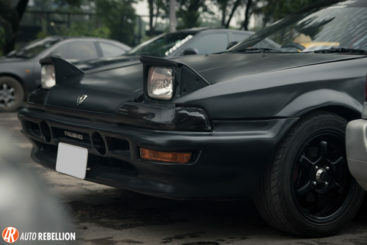 The rx7s however could not make it to the meet since the owners were not in the country. The meet took place at cantonment railway station , Dhaka. Such a meet is a refreshing hangout for everyone on the weekend as is a perfect hangout getaway from the chaotic city life. Cars are an real life expression of our own personality and that’s how we love to exchange and share the same passion together in such meet. The visitor’s cars ranged from mark 2 tourer Vs chaser Tourer Vs to mid engined MR2 and MRS. Toyota Trueno, Honda Civic, Mitsubishi EVO 8. We also had a chance to see the newest MX5 roadster brought in by Car House Limited. 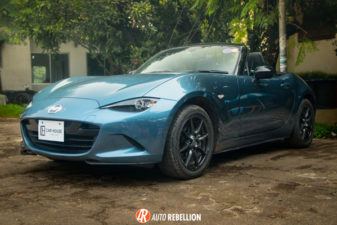 It’s a very small nimble fun sports car, perfect for Dhaka that goes along side the GT86 in the country. 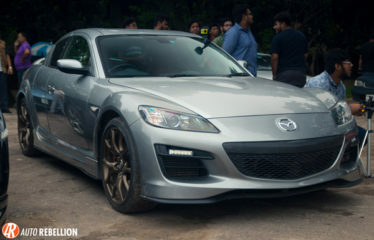 The Rx8 production sadly enough was halted in 2012. We hope Mazda develops the rotary to be more efficient and exhilarating in the future model. Mazda have been teasing us all with the development of a new generation of sports car with a more powerful rotary engine. Till then we should cherish this most innovative, futuristic engine architecture of all times in the present and bring back those RX8s that have lost their original heart.